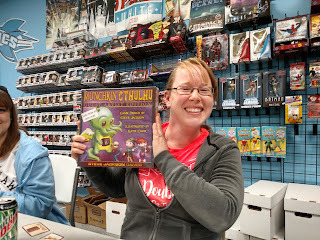 Christina Billings is the winner of the Munchkin tournament. She has never played before! Join us Saturday nights for our new Saturday Night Munchkin Social. Though we may have nights when other events are scheduled, such as our 3rd Saturday Scifi Meetup, we're designating Saturdays as an evening to "kill the monsters, steal the treasure, stab your buddy!" We'll start at 7pm and play until store close or everyone is tired.